Georgia Bowl Riders Championship is Grass Roots Skateboarding at its finest! Check out this update from the Annual Georgia Bowlriders. Registration has begun so get over to GEORGIABOWLRIDERS.COM if you’re trying to get in on the action. 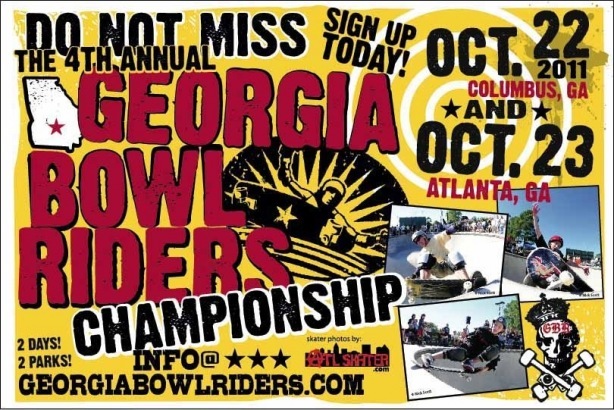 Shredding will commence October 22 in Columbus, GA.This year Georgia Bowlriders expect as many as 100 skaters of all ages from across the country. Two days and two parks on some of the best concrete anywhere. Entry fees are $60 for one day and $100 for both. Sign up today and be a part of the action. Also check out results from last year's results from Salba.